The mysteriousness of God	Does God Laugh? If So At what? A mighty woman of God…Aunt Mae! Aunt Mae and me. She spoke spiritual life into me! She would say to me…”Now Tanya…God can do anything but fail. He will never let you down”. This is my Aunt Mae and this VERY godly woman was a big influence of faith in God in my life. I saw Jesus in her!! She loved everyone and she was there for everyone who needed help physically and financially!! She had so much faith and prayed for many people including me and my children. Aunt Mae didn’t get much schooling. She learned to read by reading the bible. As an adult her vision was very poor so she memorized the scriptures and quoted them to everyone. She shared her faith with family, friends and strangers whether they wanted to hear it or not. She was the pastor of a Pentecostal church and never married until God blessed her with a husband when she was in her 80’s. Aunt Mae outlived her husband. In her 90’s she had to have her leg amputated. She wanted to go back to live in her home and with one leg she climbed the long flight of stairs to her apartment on top of her church. God had shown her many miracles over the years and she knew that He wouldn’t let her down. For many years now…..she’s been in the loving arms of our Lord and Savior. I celebrate her life and legacy. She lived how God wants us to live in His word and I pray that I’m following in her footsteps and being obedient to the leading of the Holy Spirit in my life. 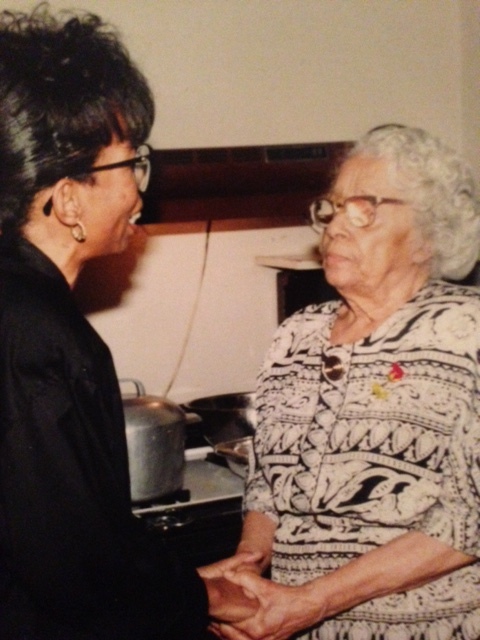 I thank God for my…Aunt Mae! Your Aunt Mae does sound like a wonderful person. I look forward to meeting her in heaven. This is just a lovely example of how important it is that we live a Godly life, Tanya. Folks are listening and watching; many times, they’re first attracted to God by what they see in the people they know and love. I’m sure your Aunt Mae is watching — and smiling! — down from Heaven on the good you’re doing in her place! I sure am trying to follow her example! Thank you! Hugs to you! Your aunt Lorraine sounds like a wonderful woman also. I’m so sorry you too suffer with an illness. All I can say is…But God!!!! Oh the grace of God that sees us through our suffering. I’m looking forward to my eternal life. Until then I hold onto Jesus precious hand and serve Him as hard as I can! God bless and keep you in His loving care. Oh wow! What an example to follow. May we all get closer to God.